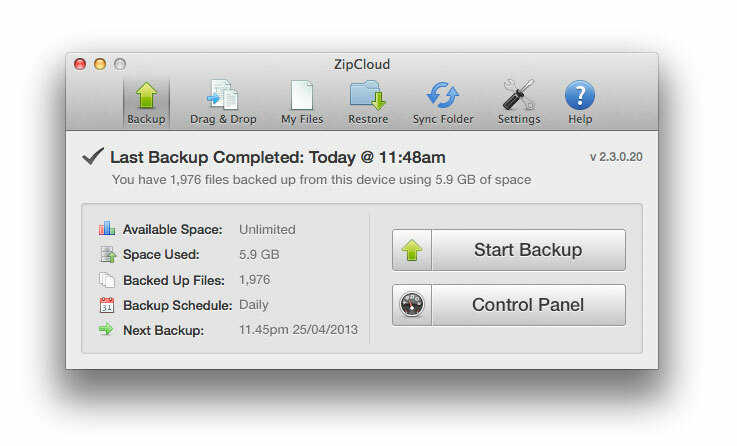 ZipCloud is very excited to announce the release of the new Mac v2.3.0.20 app, now available to all our cloud storage users new and old. This new version provides a number of improvements which further optimize the speed, responsiveness and functionality of the desktop app—meaning our users’ cloud storage experience has just hit an all-new high! There are also a number of cool new features we’ve added. For instance, in response to the feedback received from our existing users, the app now comes equipped with a ‘Resumable Uploads’ feature. Its function is as simple as its name suggests. Picture the situation: you’ve just got back from holiday and are uploading a giant video to your cloud storage account, but midway through the upload, your internet connection suddenly fails. Nightmare! You have to now reconnect and start the upload all over again, right? Wrong! With the new Resumable Uploads feature, when you reconnect, the file will continue uploading from the last point before the connection was lost. So all you need to do now is upload the second half. Pretty handy, right? Among the other features is a ‘Language Selector’, which now lets users select from American or British English, German, French, Italian, or Spanish. New users of our cloud storage service can instantly benefit from this new update by simply subscribing for a FREE ACCOUNT and proceeding to install the desktop app to their Mac-based computer/notebook. As for existing users, they won’t have to lift a finger, as their app will be automatically updated.